A Festival of Mummies was discovered recently by an Egyptian team at Bahariya Oasis, located about 380 km west of the pyramids. Four tombs were excavated, and 105 mummies were found inside them, many of them beautifully gilded. These mummies, many sumptuously decorated with religious scenes, represent the very best of Roman-Period mummies ever found in Egypt. These ancient remains are around 2000 years old, but they have withstood the test of time remarkably well. The story of the discovery began about three years ago, as I was excavating the site of the tombs of the pyramid builders. I was cleaning the skeleton of a workman who once was working in constructing the great pyramid. My assistant Mansour Bouriak told me that there was a very important discovery at Bahariya . I stopped cleaning the skeleton and I said "Mansour: is this one of your latest jokes?" Mansour replied "Ashry Shaker Chief Inspector of Bahariya is here and wants to tell you about the discovery." Ashry said, "We have found beautiful mummies. You have to leave these skeletons because lots of mummies have been found." He added, "Yesterday the Antiquities guard Aiad was riding his donkey along the side of the road that leads to Farafra Oasis, some six kilometers south of the town of El-Bawiti, the Capital of Bahariya. The donkey tripped, hitting its leg on the edge of tomb." I told Ashry to start excavating this tomb, and I would visit the site the following week. 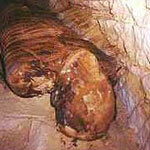 When I went to see them in May 1996, I could not believe that such beautiful mummies could exist. Their eyes were looking at me as if they were real people. Another mummy discovered reminded me of the mummy used by Hollywood in the movie Curse of the Mummy. The tombs with the mummies were a stunning cache. 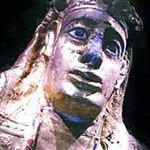 In 1996, the Bahariya Inspectorate of Antiquities did not have sufficient funding nor enough qualified excavators and conservators to properly preserve the mummies. Therefore, we kept this discovery secret; we did not announce it because we were afraid that thieves could smell the taste of resin that was put inside the mummies. 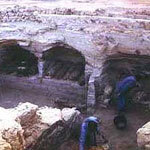 I felt that this site should be excavated to preserve the mummies and also to know the size of the cemetery. I led a team of archaeologist, architects, restorers, conservators, draftsmen, an electrician, and an artist. We camped in the desert and stayed in a very nice motel near the site. It was a nice change to leave the pyramids and excavate mummies. Mummies conjure up so many images in people's mind. Most people know about mummies through scary movies. They inevitably evoke horror movies. But the significance of this find is that it is the first exciting thing that has brought Egyptomania to the modern world. To me this is personally very exciting, but I am not overawed by the scary reputation of mummies. To me it is a science and this remarkable find gives me the chance to find more out about people from another place and time.